Arusha offers a cornucopia of things to do. Whether you are a nature lover, sports enthousiast, culture buff or dolce far niente aficionado, you are sure to find an activity that will make your heart beat slightly faster. Browse through all the possibilities and count on us to help you organize an unforgettable experience. Tanzania is famous for its impressive nature and wildlife. Lake Duluti, Monduli Mountains, Arusha NP, Lake Manyara NP, Tarangire NP are all within a daytrip distance. Those who want to leave the ‘safari capital’ for several days can visit a combination of these parks and/or go to the world famous Ngorongoro Crater, Olduvai Gorge or Serengeti NP or lesser known pearls like Lake Natron and Lake Eyasi. We can bring you in touch with recommended specialists to organize your trip. Probably the most beautiful balloon flight in the world and the ultimate safari experience. Closest to Arusha are the flights starting from Tarangire. All other flights take off from your central or southern Serengeti lodge/camp. In each case you are picked up and transferred to their launch site by 4×4. This safari is in high demand and therefore spaces are very limited. To secure your place we suggest you inquire with us in time. The closest national park to Arusha town is a multi-faceted jewel, often overlooked by safarigoers, despite offering the opportunity to explore a beguiling diversity of habitats within a few hours. It’s the perfect introduction to Tanzania’s wealth of fauna and flora. Located approximately 2 hours’ drive from Arusha town in Chemka and hidden by a beautiful green forest lie natural hot springs, ideal for taking a relaxing dip or to use as backdrop for a tranquil picnic. Marangu – meaning Land of Water – is a romantic, rural town surrounded by lush landscapes and hidden waterfalls. It’s a nice place for swimming and exploring the foothills and forests of Kilimanjaro. Tarangire is one of Africa’s little-known gems and should be on the itinerary of all wilderness lovers. The wildlife is as diverse as its landscape and the park is particularly famous for its large elephant herds, which are among the largest in Tanzania or perhaps in whole Africa. Lying at the foot of the scenic Manyara Escarpment and surrounding the lake, Lake Manyara National Park is famous for its diverse wildlife, acacia woodland and rich diversity of birdlife. Its relatively small size makes it ideal for an exciting day trip. Nicknamed the eighth wonder of the world and a UNESCO World Heritage Site, the crater is the world’s largest unbroken volcanic caldera which hosts a variety of animals including the rare black Rhino. Hiking gives you unparalleled contact with local people and nature. Whether you prefer a short walk in the neighbourhood, meet the Hadzabe bushmen, Datoga nomads or want to climb the, Mount Meru, Kilimanjaro or Ol Doinyo Lengai. We can bring you in contact with experienced Tour Operators to organize your adventure. You will be taken to the slope of Mount Meru for an 8km walk through the Mount Meru forest, an old, thick forest with a magnitude of birds, Colobus monkeys and small antilopes. 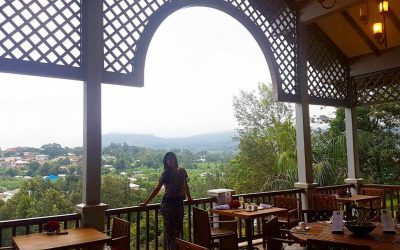 You will have lunch in a beautiful spot at the top of the waterfall where you have a stunning view over Arusha town. Whether you are interested in golf, canoeing, mountain biking, horse riding, tennis, scuba diving or snorkeling, we are ready to help you to keep you fit and healthy during your stay in Tanzania. Of course you can swim in one of our swimming pools, work up a sweat in the fitness or have a jog in the colorful surroundings. But did you know there is a championship 18-holes golf close by? Why not go for a round of golf on the lush greens with Mount Kilimanjaro as a backdrop. For those who want to combine wildlife watching with some physical activities we can highly recommend the following canoeing trips. The one on Momella Lake (Arusha National Park) takes 2- 2.5 hours during which time you’ll observe buffaloes, bushbuck, giraffes, hippos and many water birds living in and close to the water. The one on close by Lake Duluti is a very special and quiet 1,5 hour tour across the smooth surface of this small Crater Lake with birdlife seldom seen; Giant kingfisher, Fish eagle, Darters and many more. Biking does not get better than what is available in and around Arusha. There are thousands of miles of single-track routes to explore. Most of these paths are nice and smooth for easy riding. Obviously there are more challenging routes for those who want to get their hearts really pumping. All mountain bike rides are designed to give you both a wildlife and cultural experience. You will encounter local Tanzanian farmers, kids and the rest of the communities. We offer two hour, half or full day bike rides through the villages of Usa River, Tengeru or up the lower slopes of Mount Meru, into the lush fields of these slopes. Arusha and its surroundings is a true bird watcher’s paradise. Over five hundred species of birds occur in the Arusha area. From our gardens on Namasi Hill, you have a fantastic view on the birds flying over the valley in front. For real ornithologists, there are also great bird watching opportunities in the diverse habitats on the slopes of Mount Meru or around Lake Duluti. entirely to the local community. Because we believe that a good education is the key to a better future we support the very nearby Baraa Primary School with two paid cultural walks, whose proceedings benefit entirely to them. These walks encompass an actual visit to the Baraa Primary School. A unique way to see how a primary school in Tanzania works and to discover how iThemba (the Belgian foundation we are actively involved in) created a pleasant learning environment for the children and what projects are being followed-up or launched (the vegetable garden project, the annual health check,…) by iThemba to focus on the quality of education and on the quality of the children’s lives. Meru Cultural Tourism is a local organisation specialised in cultural tours. Their expert guides know the greater Arusha area like the back of their hands and are walking encyclopedias on subjects ranging from local life, plants and birds, arts and crafts, local food, agriculture and so on. It will be a pleasure for them to take you on an unforgettable walk that will be off the beaten track in more than one way. On the following pages you will discover the cultural walks on offer. Although they all have their own specificity, all the cultural tours have one thing in common: they all give you an in-depth experience of the local surroundings and a unique insight into the people and their way of living. And most importantly, the profit goes entirely to the local community. This trip will take you to a local organic and Fair Trade coffee farm. As you walk through the plantations you will be educated on the entire coffee-processing. You’ll enjoy a cup of coffee with the farmers while having a homemade Tanzanian lunch. You will also get the chance to visit the oldest church on Mt. Meru and to visit a local primary school. Our local guide will show you the centre of Arusha. You will get a chance to visit the busy local market, see some beautiful African artifacts in the Cultural Heritage Museum or buy some local souvenirs at the Masai market. Let us help you through the maze of markets, and provide you with an insider’s shopping experience to make your holiday complete. Enjoy a relaxing morning at the local market where you can find all the tropical fruits, vegetables, plants, local crafts and colourful materials. The Makonde tribe of southern Tanzania are famed for their abstract wood carvings, including remarkable ‘trees of life’ which perfectly illustrate the archetypal African concepts of remembrance and continuity. Have a look at the Cultural Heritage Centre or visit the Antique Makonde Carvers workshop in Arusha to buy directly from the craftsmen. Vivid, bright colours and humorous designs are often used in these popular paintings. The style takes its name from the artist E.S. Tingatinga, born in the 1930s in South Tanzania and later moved to Dar Es Salaam, where he died in 1972, shot by the police who mistook him for a criminal. Our art collection has several paintings from the Tingatinga school. We can show you the best places in Arusha to buy the finest paintings. One of Africa’s best known tribes, the cattle-herding Maasai inhabit Northern Tanzania and Kenya. Their colourful blanket cloths provide picturesque photo-opportunities. We can bring you to the shops, close to the Arusha Central Market, selling blankets where also the Maasai buy them! Northern Tanzania, specifically the region around Arusha, is the only place on earth known to contain Tanzanite, a precious transparent gemstone, first discovered in 1967. In its normal form, it is brown but when heated up to 500°C it acquires a characteristic colour and brilliance: from blue to violet and a rare olive green, which costs upwards of $500 per carat.